When the entire country is gripped in a happy and festive mood after officially lifting tsunami danger, Sri Lankans celebrated the traditional Sinhala and Hindu New Year in usual grand style. According to the astrological charts, the most eagerly awaited National New Year dawned at 7.42 pm local time on 13 April. This is the third National New Year the whole country is celebrating in an environment of peace and tranquility since the total eradication of terrorism. 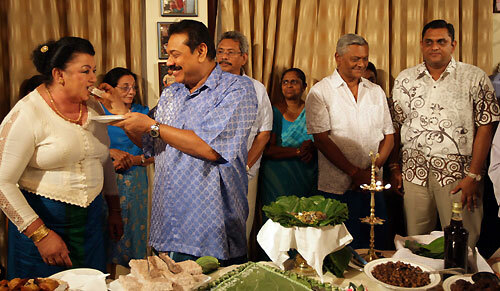 The Sri Lanka’s first family including President Mahinda Rajapaksa also celebrated the Sinhala and Hindu New Year rituals at Carlton Residence in Tangalla, Hambantota yesterday on 13 April. 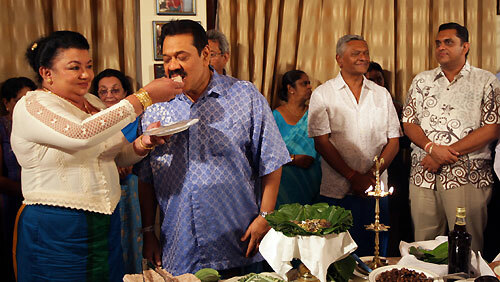 First Lady Shiranthi Rajapaksa conducted all the rituals at the auspicious time with the President Rajapaksa and other family members assisted her. The auspicious time for the lighting of the hearth was at 7.42 pm. President Mahinda Rajapaksa and First Lady Shiranthi Rajapaksa and many other family members attended the symbolic tradition of boiling milk at the auspicious time. As mentioned by astrologers milk rice was prepared with jaggery and ghee, attired in white and blue colours and facing the Southern direction. The auspicious for partaking of the first meal for the New Year was at 10.28 pm. In addition to taking the first meal, transactions were also conducted, attired in blue and white colours and facing the south. 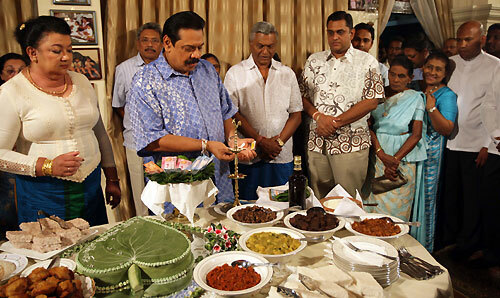 President Rajapaksa, the pilot who crafted the environment for the entire nation for the partaking of the meal prepared with new rice of a new yield, also joined in this tradition setting an example for the whole country. 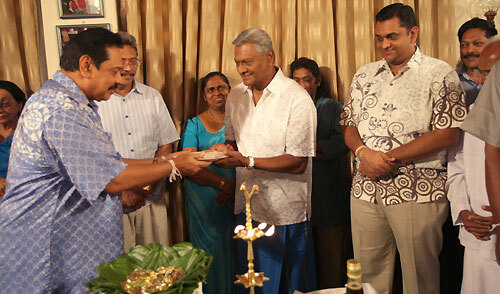 President Rajapaksa's brothers, Speaker of the Parliament Chamal Rajapaksa, Defence Secretary Gotabhaya Rajapaksa and nephew, Chief Minister of the Uva Province Shashindra Rajapaksa and many other family members participated the celebrations. They all are seen here with locals and President’s close supporters enjoying Sinhala Avurudu traditions at Carlton House. President Mahinda Rajapaksa also participated in the traditional transaction of the New Year and took part in the celebration of the New Year in warm fellowship with the people of the area. The President did not forget to perform the tradition that is undertaking transactions for the New Year by visiting the Bank of Ceylon and People’s Bank branches in Tangalla. People’s Bank Chairman W. Karunajeewa was present at the occasion. The state sponsored oil anointing ceremony for the New Year will take place on Sunday 15th at the auspicious time of 7.08 am at the Natha Devalaya premises of the Sri Dalada Maligawa under the patronage of Prime Minister D.M. Jayaratne.